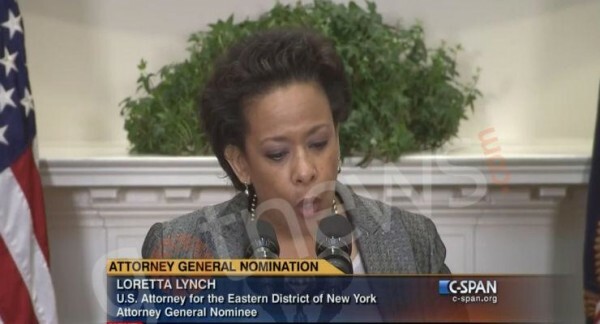 Obama AG Nominee Lynch Belonged to Jew-Hating Pro Terrorist Group | Virginia Right! As if outgoing Attorney General and anti-white racist Eric Holder was not bad enough, Obama has found someone who is, believe it or not, even more of a left-wing radical. Attorney General nominee Loretta Lynch belonged to a student group that brought Jew-hating Palestinian terrorists to Harvard Law School every year she was a member. Lynch belonged to the Harvard Black Law Students Association (BLSA) from 1981-1984 when she was a student. During those years the radical black group brought representatives from the Palestinian Liberation Operation (PLO). The group’s leader, Mohammed Kenyatta, called for the “liberation of Palestine” and expressed support for the terrorist organization. The BLSA defended bringing the terrorists in a letter to the editor of the Harvard student newspaper, The Harvard Crimson. Jewish student organizations protested the speeches, especially in 1984. Liberal professor Alan Dershowitz joined the anti-PLO protests. The Harvard Crimson condemned the response of Lynch’s organization in 1984. The Black Law Students Association (BALSA) committed an unjustifiable and discriminatory violation of student liberties last week when it denied Jewish students an opportunity to participate in a campus forum featuring a representative of the Palestinian Liberation Organization (PLO). We cannot expect anything else from a doubling-down ideologue like Obama. I wondered about early comments from “conservative” commentators that she is “highly qualified”, and known to be a “firm but fair”. Obama’s definitions of “qualified” and fair” are all he recognizes, and they are far removed from any found in Webster’s – or in the minds of the American people. Confirmation of this nominee should be fought against, because she participated in institutional racist activities. Then again, who will he choose next? Oh, please. The Harvard Law School Black Student Association is not a “Jew-hating pro-terrorist” group just because it invited controversial Palestinian speakers to address a student group. Simply giving them a chance to speak doesn’t mean they supported their views. And simple membership in the group doesn’t mean Lynch supported bringing in the PLO speakers. I’m a member of the Democratic Party but don’t agree with everything in the platform or support every candidate. This is pretty weak tea. I expected better. What parts of the democrat platform do you NOT agree with and which democrat candidates do you NOT support?